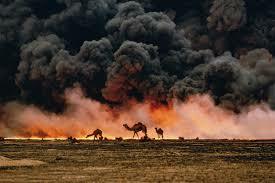 Iraq invades Kuwait which triggers events that eventually leading to the Gulf War. On Aug. 2, 1990, Iraq invaded its neighbor Kuwait, triggering a series of events that would culminate in the 1991 Gulf War. Iraqi President Saddam Hussein ordered the invasion, citing unfair Kuwaiti economic practices, perhaps owing to an unclear understanding of America’s position. Hussein had become president of Iraq in 1979, though he had been the power behind the scenes for many years prior. That same year saw tremendous upheaval in Persian Iran, Iraq’s eastern neighbor. The Iranian Revolution was rooted in Islamic fundamentalism and rejected secular influences like capitalism, communism, nationalism and liberalism. By contrast, Hussein was an Arab nationalist leader who paid lip service to Islam, but who held Adolf Hitler and Josef Stalin as his role models. Afraid that Islamic fundamentalism might spread to Iraq, and wishing to expand his power in the Middle East, Hussein ordered a surprise attack upon Iran in September 1980. The resulting Iran-Iraq War proved to be one of the most barbaric in modern history. One reason why Americans feared Hussein’s weapons of mass destruction in the early 2000s was because he had not only possessed but used WMDs in his war against Iran in widespread chemical weapons attacks. By contrast, the Iranians frequently used their soldiers as cannon fodder, even sending students into minefields to clear a path for their tanks. Offering Iraq a measure of intelligence and logistical support, the United States also weapons to the Iranians, in what would become known as the Iran-Contra scandal, something even President Ronald Reagan’s staunchest supporters admitted was an ill-conceived scheme. After years of strategic stalemate, the Iran-Iraq War ended in 1988. Exact numbers for Iran’s war dead are still not known, though some have suggested that they may have lost as many as half a million citizens. Iraq’s debt stemmed largely from its agreements with other Middle Eastern states such as Kuwait, Saudi Arabia and the United Arab Emirates. Not wishing to see a radical Shi’ite Muslim victory in the war, these Sunni states increasingly loaned Iraq the money it needed to fund its war. With the war ended, Iraq found itself heavily in debt to its fellow Arab states. Like Kuwait, Saudi Arabia and many other Arab states, Iraq’s principle source of income came from its oil exports. With so much of its economy smashed by the war, Iraq could not meet its financial obligations during the agreed upon timetables. To make matters worse, Kuwait and the UAE began overproducing oil, driving down prices across the Middle East. For Hussein, this was an unacceptable slap in the face to a nation that had bled to protect the Arab states. In her official report following the meeting, Glaspie stated of Hussein that “his emphasis that he wants a peaceful settlement is surely sincere.” Apparently, she believed she had made herself clear, and that the U.S. and Iraq had an understanding. Clearly, Hussein must have seen Glaspie’s statement of “Arab-Arab conflicts” as a sort of green light. Hussein’s invasion of Kuwait reminded much of the world of Hitler’s unprovoked and illegal attacks prior to and during World War II. Despite the delicate situation unfolding in Eastern Europe, the United States assembled a coalition of nations, including many in the Arab world, to stand up to Hussein’s naked aggression. The Gulf War began in January 1991 and ended with the Iraqi army largely vanquished and Kuwait liberated a few weeks later. 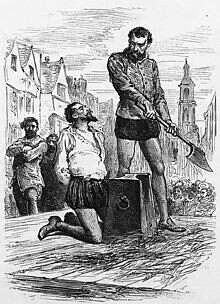 Thomas Grey is beheaded for conspiring against King Henry V.
The positron which is the antiparticle of the electron is first discovered by Carl Anderson. The British win the Battle of the Nile. Albert Einstein and Leó Szilárd write to Franklin D. Roosevelt, urging him to develop a nuclear weapon. A bomb explodes and kills 85 people at the railway station in Bologna, Italy. Albert Einstein and Leó Szilárd wrote a letter to Franklin D. Roosevelt, urging him to develop a nuclear weapon. A massacre is carried out in Valvettitura by an c in Sri Lanka that killed 64 ethnic Tamil civilians.